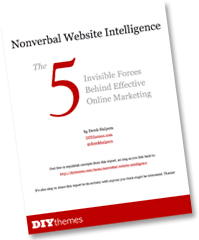 Download the Nonverbal Website Intelligence Report Now! Most people tell you to create lots of content to communicate with your audience online. This is more-or-less equivalent to verbal communication. If you ignore this type of communication, you risk losing out on visitors, subscribers, and sales. However, if you know how to harness the power of these nonverbal cues, you’ll be able to turn random website visitors into loyal subscribers and customers. You’ll also receive valuable tips for running an optimized, high-performance website that ranks like a champ in search engines. To receive this report, enter your email below and click “Get the Report!” After confirming your subscription, you’ll be allowed to instantly download your free report!